These two companies are involved in a war that could be very painful for the other. Apple and Qualcomm are involved in a global patent and licensing battle. As part of this battle, Apple instigated the FTC to sue Qualcomm to prove the worth of their patent licensing program. The battle with the FTC has lasted two years and it will come to a head with a 10-day nonjury trial starting on January 4th. 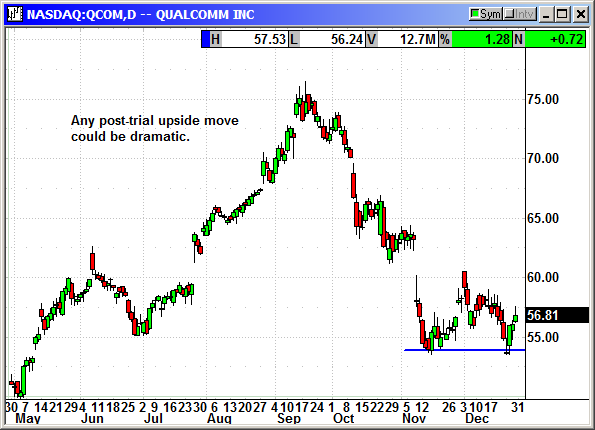 The outcome of this trial will be life changing for Qualcomm. They will either emerge victorious and be due nearly $8 billion from Apple or they will crash and burn with their licensing program ruled invalid. Buy Mar $60 Call, currently $2.26, stop loss $54.35. Buy Feb $52.50 put, currently $1.46, stop loss $59.25.